Endoscopic treatment of obesity has become an option for patients who are not eligible for bariatric surgery. One of such treatment is an intragastric balloon. Once placed in the stomach, the balloon is inflated and it occupies about 80% of the stomach capacity leaving only 20% for food. This leads to early satiety, reduction in food intake and subsequent weight loss. Another proposed mechanism of action is by delaying the gastric emptying. There are many types of gastric balloon. One of them is Orbera balloon. It is the most frequently used intragastric balloon and was previously known as BioEnteric Intragastric Balloon (BIB) (Kim, Chun, Choi, Kim, Keum & Jeen, 2016). It is also the most studied intragastric balloon. The FDA approved the use of the Orbera balloon on August 5, 2015. It is expected that the Orbera balloon could provide a valuable and less invasive therapeutic approach to bariatric treatment (Kim, Chun, Choi, Kim, Keum & Jeen, 2016). The indications and contraindications for Orbera balloon areas for the gastric balloon in general. Orbera balloon is made of silicone material. After placement, it is inflated with 450-700mls of normal saline (salt water) mixed with methylene blue. If an unexpected balloon rupture occurs, the methylene blue turns the urine blue or green (Kim, Chun, Choi, Kim, Keum & Jeen, 2016). Interested in the Gastric Balloon Procedure?. Contact our helpful patient educators today to learn more about your options for weight loss surgery. The balloon is inserted endoscopically under conscious sedation and removed after 6 months by the same endoscopic procedure. Following the placement of the balloon, there may be some degree of discomfort and some patients may experience nausea and vomiting within the first week of placement. These can, however, be managed with appropriate medications. Your doctor may place you on a liquid diet for few days following Orbera balloon placement, with a gradual transition from liquid to semi-solid to solid foods. It is also important to adhere strictly to the dietary and lifestyle modification plans as prescribed by your doctor/nutritionist to ensure optimal weight loss. In a study conducted by De Castro et al., on patients with Orbera balloon placement, the mean weight loss at 6months was 14.1kg, with a mean reduction in BMI of 5.5Kg/m2 and average percentage excess weight loss (EWL) of 30.2% (De Castro et al., 2010). In another study conducted by Giardiello et al., the mean percentage EWL was 20% (Giardiello et al., 2012). These variations in percentage excess weight loss may be accounted for by the individual differences in the compliance with dietary modification following surgery. In terms of resolution of comorbid conditions, a study was conducted by Crea Pata et.al. 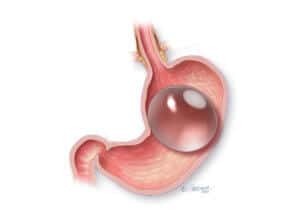 143 patients undergo intragastric balloon placement (Orbea), Incidence of metabolic syndrome dropped from 34.8% to 14.5% at 6months post insertion and 11.6% at 12months post removal (Crea Pata G, Della Casa D, Minelli L, Maifredi G, Di Betta E, Mittempergher F. et al., 2009). In the same study, the incidence of type 2 diabetes mellitus (DM) reduced from 32.6% to 20.9%, hypertriglyceridemia reduced from 37.7% to 14.5%, hypercholesterolemia reduced from 33.4% to 16.7%, and hypertension incidence decreased from 44.9% to 30.4%, all at 6months post insertion of the balloon. HbA1c blood concentration (a measure of blood glucose control) shifted from an average per procedure value of 7.5% to 5.7%, 5.6%, and 5.5% at 6 months, 12 months, and 18 months post-insertion (Crea Pata G, Della Casa D, Minelli L, Maifredi G, Di Betta E, Mittempergher F. et al., 2009). Orbera gastric balloon, formally known as the BioEnteric balloon is an efficient and safe endoscopic treatment of obesity with a significant weight reduction and minimal side effects. It also has the advantage of causing improvement/resolution of comorbid conditions associated with obesity. Get a free consultation on the Orbera procedure in Mexico. Contact our helpful patient educators today to learn more about your options for weight loss.